Comments: ALTERNATE EDITION: CONTENTS SAME AS STUDENT EDITION, but may have instructor notes and/or publisher markings. REVIEW COPY. May not include student CD or access code. BRAND NEW Over 1,000,000 satisfied customers since 1997! We ship daily M-F. Choose expedited shipping (if available) for much faster delivery. Delivery confirmation on all US orders. 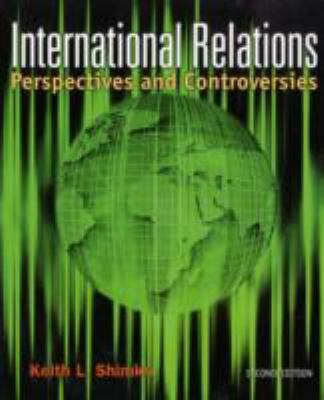 International Relations: Perspectives and Controversies offers an innovative approach to this introductory course. Each of the topical chapters covers an enduring and important debate in the field and examines how political actors or political thinkers explain and defend their different opinions. This format offers the students the chance to understand important issues in International Relations as dynamic struggles over resources and power.Each chapter is structured in four parts. The first part provides a historical overview of the issue, its origins, evolution, and current status. The middle two sections of each chapter map out the opposing or contrasting points of view within the debate. These debates are followed by an evaluation of the merits of each position and the scholarly and political assessment of the situation.The goal of the text is to help students think systematically and critically about international affairs. By distilling the discussion from a variety of viewpoints (rather than simply providing articles by scholars who disagree), the author highlights meaningful distinctions among differing political positions in a way that helps students understand not only the headlines from today and yesterday, but more importantly, those from tomorrow.Shimko, Keith L. is the author of 'International Relations', published 2007 under ISBN 9780618783502 and ISBN 0618783504. Loading marketplace prices 36 copies from $1.79 How does the rental process work?